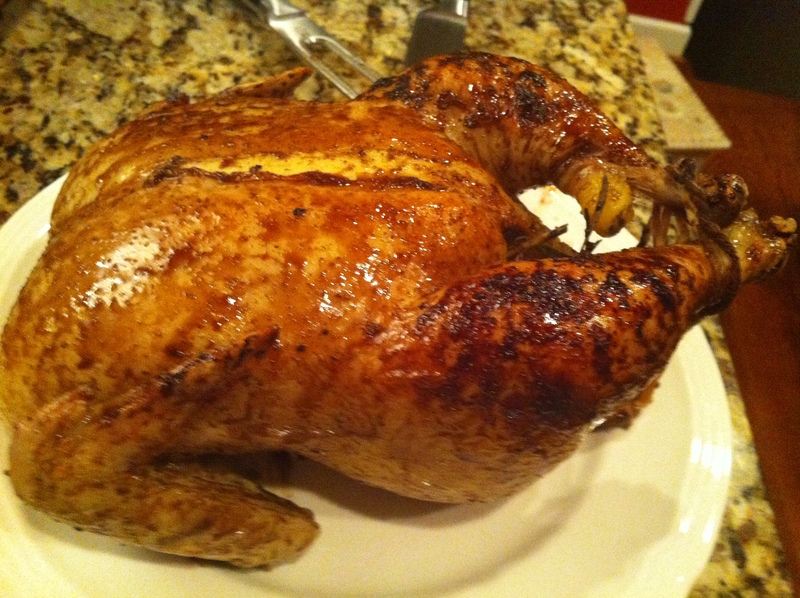 There’s something about roasting a whole chicken that just makes me feel chef-y. Granted, roast chicken is a very simple thing to make (but like all simple things, not easy to master) but there’s something about working with a whole bird and then the ceremony of carving that is just satisfying. Tonight for dinner, I decided to do a twist on my usual roast chicken (which I will have to post a recipe for soon! I have a secret method that practically guarantees moist meat and crispy skin.) Unfortunately, I couldn’t use that method with this recipe because you have to glaze the chicken and the method I usually use has a strict rule of NOT OPENING THE OVEN for the last 30 or so minutes. Rinse the chicken with cool water and dry it with paper towels. Don’t skip the drying part–this helps get crispy skin! After 25 minutes, baste the chicken with some of the sauce. Repeat the basting about 3 more times and remove the chicken when a thermometer registers 175 in the thigh. Let the chicken rest for at least 10 minutes (up to 20 would be even better–give the juices time to redistribute into the meat) and cook the broccolini with preserved lemon sauce in the meantime. (recipe coming soon. I tried to create a version last night and didn’t like it much. Once I get the recipe right, I’ll share!